Card Text Shadow Self deals no damage when fighting. Damage dealt to non-Specter neighbors is dealt to Shadow Self instead. If Shadow Self gains either the Assault or Hazardous keyword, can it deal damage to opposing creatures? Yes. Shadow Self is not able to deal damage when fighting, but can deal damage from other abilities and keywords. 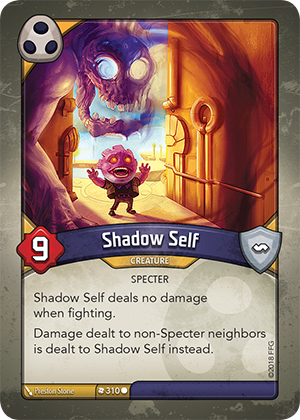 If Shadow Self has 8 damage tokens and damage is dealt to its neighbors (by something like “Deal 3 damage to each creature”), does Shadow Self take all the damage, or does it only take damage until it is destroyed? Shadow Self takes all the damage and its neighbors don’t take any damage. All damage from a single ability or effect is dealt simultaneously, making it possible for a creature to get more damage tokens than it has power. Therefore, Shadow Self would end up with more than 9 damage tokens after all damage is dealt, at which point Shadow Self would be destroyed. How does Shadow Self work if it’s next to a creature with the Taunt keyword? The same as with other neighbors of creatures with Taunt - it can’t be directly attacked. Damage dealt to the neighboring creature (which has Taunt) is dealt to Shadow Self in the same way as for any other neighboring creature, because Taunt only prevents directly attacking neighbors, not damage being dealt to them. How does Shadow Self work if it’s next to a creature with the Elusive keyword? The first time an Elusive creature is attacked, it is dealt no damage, so no damage is dealt to Shadow Self. However, the second time an Elusive creature is attacked, damage will resolve as normal and Shadow Self will take the damage instead. If there is a Shadow Self on either side of a creature that is receiving damage, which Shadow Self receives the damage?